Mitsui Fudosan UK and development partner Stanhope plc have confirmed lettings with three major food and beverage brands at Angel Court, the partnership’s 300,000 sq ft prime office building in the heart of the City. Modern Peruvian restaurant Coya has signed for 4,500 sq ft of bar and restaurant space in the southern-most section of the scheme’s ground floor, whilst The Natural Kitchen has completed a deal for 6,000 sq ft in the Copthall Avenue unit, across the building’s ground and lower floors. Speciality coffee, food and wine company Notes has also signed for 1,500 sq ft in the unit to the south of the building’s reception. Alongside the delivery of significant office accommodation, Angel Court is set to rejuvenate the surrounding streetscape by improving the existing retail and leisure offer for the area’s workers and visitors. The three lettings represent a major milestone for the scheme, introducing a mix of highly sought-after brands offering alfresco dining to the neighbourhood for the first time. The deal agreed with Coya will see the brand open only its second site in the UK, showcasing its unique range of South American dishes and drinks in the City for the first time. The operator already has established and successful sites in Mayfair, Miami and Dubai. The Natural Kitchen, which was first founded on Marylebone High Street in 2007, will provide a varied all-day offer for consumers, serving a range of healthy, freshly prepared food and drinks. Angel Court will be The Natural Kitchen’s eighth site in London. As a result of the letting, Notes will open its eighth store in London, with other locations including King Cross, Trafalgar Square, Canary Wharf and the Gherkin. Notes is a well-known speciality coffee shop and wine bar in the capital, serving over one million cups of coffee annually. In the evenings customers can enjoy an inspired wine list from around the world, alongside local craft beers. 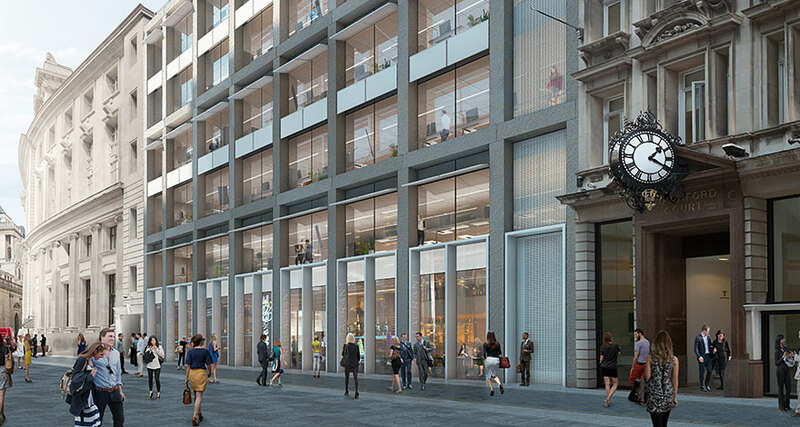 The 24-storey Angel Court is located in the heart of London’s financial district and next to the Bank of England and will provide high quality office accommodation alongside the scheme’s retail and dining offer. The building is one of only two office schemes set to complete in the City this year. The sky floors offer floorplates of 9,000 sq ft and boast uninterrupted 360-degree views of the London skyline. The garden floors range from 18,000-26,000 sq ft and benefit from a number of terraces. Angel Court, which is expected to complete in December of this year, has been designed by Fletcher Priest Architects who sought to create a sustainable, urban workplace in the form of a light, bright, glass tower. The design focused on creating large floorplates across the ‘Garden’ floor and unique panoramic views across the Bank conservation areas on the ‘Sky’ floors.